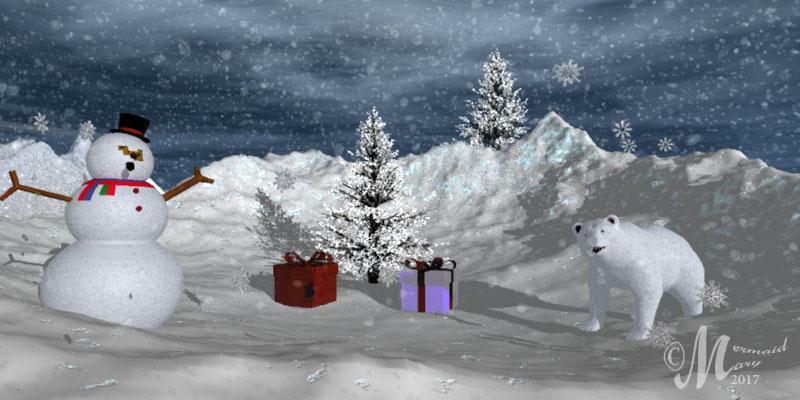 After following Hansmar’s suggestion, my 3rd winter scene render. Thanks Hansmar. A quick render with neon light. The original Bryce file show the neon light quite bright. When convert to jpg, even on max quality, you can't see brightness of neon clearly. Nice! I imagine this took some time to set up and arrange, all the various models. I like the way you've found reasons to introduce some light into the night time version, such as the headlights on the truck. mermaid010: The scene is getting better together. Well done. launok: Great scene and very nice lighted renders! Launok - for a novice you are doing awesome work in Bryce. Mermaid - getting better at each iteration. launok - well put together scene. Mermaid - looks very good. Try to bring in a more complicated object, like a Stanford dragon, for instance. Just something that has no smooth surface. I am now done with this scene - time to move on. Since I have started playing more with lighting I take this one a bit in "overdrive mode", if I can put it like this. Last night I started to play also with the mat ambience as seen on the letters but it wasn't so easy as some letters have too much glow making them appear fatter, i.e. Dunkin and some colours not quite the same. I have used the 'mat' settings next to each letter wireframe, thus done them one by one. When I have to choose the colour I couldn't get the exact, precise tone. Launok, Your neon signs came out great, well done. @Mermaid010: Cute winter scene and nice occlusion light study. 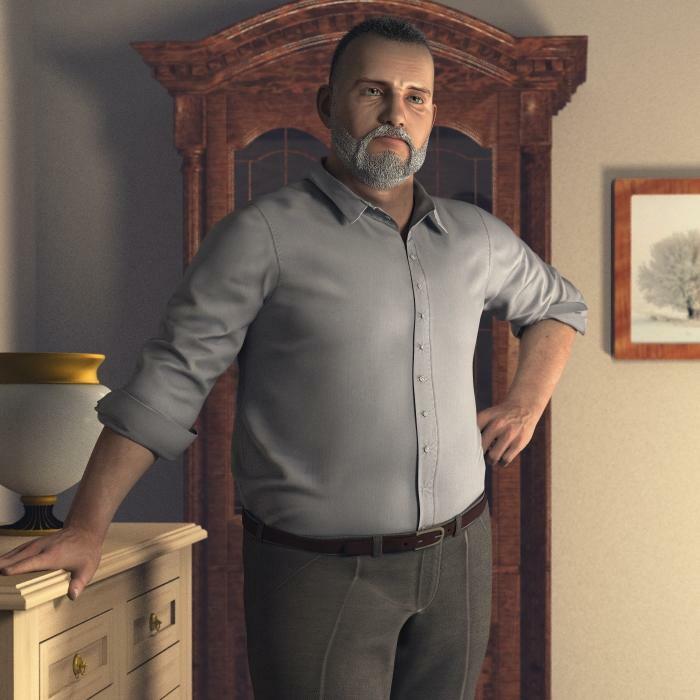 I made a study of an ordinary man with DAZ3D Buzz hair and Unshaven.TA render with a render time about 35 minutes. Electro-Elvis...Nice pose & expression, but those wrinkles in the shirt are awesome. Thanks a lot S Ray. The credit belongs to the modeller of Eldritch Seeker Package in DAZ3D Studio. Really a good model. Love your night sky and the atmosphere. Electro-Elvis - At the first moment, I thought it was a photograph. Excellent render. S Ray - now that the aspect ratio is correct, your comet render is awesome. Thanks the comet is the favorite part of the pic for me. The figure is Poser's 10 Roxie with my custom textures and morphs added. The hair & wreath is Mada Hair by goldtassel. I must say it was very challenging getting the 7 different transparency maps assigned correctly to each individual hair object, since Bryce does not bring in trans maps when figures are exported from Poser. Nice renders from nice Brycers! Electro elvis : very nice character! I like it! Another work using the fabulous speedtree software. I've build all this trees and their bark are made of photos I've made myself in a forest. Sunlight diffusion at 800/1000, T.A 36 rays with boost light and scatering correction. Wasn't me, probably chohole did it. Electro-Elvis: Very good looking normal man. Shirt is great, as is the texture of the arms. I think for me the boundaries between beard/moustache and skin are too sharp. Maybe you can 'sink' the beard/moustache a little into the skin, so that there is not that much shadow under the moustache part? S Ray: Great render. The skin colour is a kind of eerie to me; bit greenish, in this light. c-ram: Fantastic woods render, unbelievably detailed. What a pity that Speedtree comes at such a price. Electro- Elvis - Strong characters. I like them. Slepales - So vast. Great landscape render. Chohole - Thanks for sharing Carlo Traversi's work. I had a look at the website, he has some really impressive work. Launok - A totally different feeling to the render introducing the neon lights. Wonderful result. S Ray - Lovely comet render. I like her expression. C-Ram - It's always exciting to see your name with a new render attachment. Needless to say you have managed to produce a perfect and realistic scene as always. Love everything about it. c-ram - outstanding forest scene. Not much else to say than that it is perfect. Horo - thanks I'll give it a try with another model. Launok - Awesome renders, very impressive work. Electro-elvis - thanks, great render, cool pose. C-ram - another stunning render, very photorealistic. 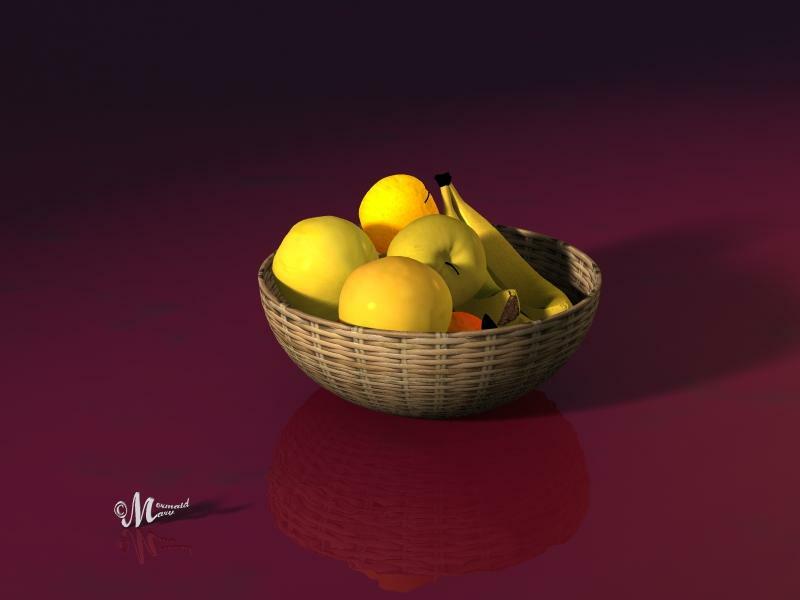 A re-render of the fruitbowl – using help I got from Slepalex. Thanks I really appreciate your help. Mermaid - Fruitbowl looks very nice, quite an improvement from the first try. mermaid010,already is better, but not good enough. It is all about material of apples or lighting. Material of apples looks like a peach with SSS (subsurface scattering). Apples should not be SSS. 1. Check the material of apples. Make Ambience = 0, and possibly reduce the Diffusion. 2. 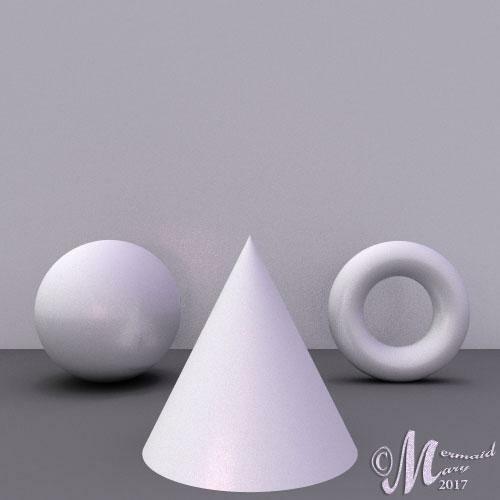 Reduce slightly Diffuse and Specular in right and left (main) light source. Or maybe you need to reduce the brightness of all the sources. In a frontal source it is possible to make Diffuse = 0,5.
mermaid010: Looks quite nice, but more can indeed be done. Slepalex is the master in this kind of still life, so always listen very carefully to him! I guess the fruit at the back is supposed to be a lemon? I think this is too light (almost shining). Maybe reduce diffuse in the material for that one (I guess quite a bit of reduction is possible). And perhaps play with the bump settings (probably increase) for that one too.